Applying binder to glass wool or for refinement of filaments fibers are sprinkled with a liquid in an air flow. The liquid is injected into the air flow as droplets. In this process collisions of droplets and fibers occur. Simulation of individual collisions of droplets with fibers is computationally unfeasible. Instead I developed a substitutional model based on stochastic processes. In this thesis I discuss how to transform droplet information collected in parcels to a density description on a grid. Furthermore, I introduced a model with accompanying equations for droplet-fiber collisions based on the particle density data. At first, a basic model is formulated enabling the proof of correctness of the basic formulae. This model is then iteratively extended to allow for application to real-world scenarios. An implementation of these equations is also provided as part of this thesis. Basis is the simulation tool FIDYST (Fiber Dynamics Simulation Tool) for simulation of fibers in an air flow developed by the Fraunhofer ITWM. This tool has been successfully applied in projects with industrial partners. For the simulations shown in this thesis I extended FIDYST to support my collision model. In addition I inquired new visualization methods related to the visualization of fibers. In a first visualization project I investigated new methods and combination of existing methods to enhance the visualization of properties along polylines. The second project has its application in geophysics: from a simulation I derived a scalar property. This property has to be visualized in a 3D model. As part of this project I studied how to extract this scalar property and developed a new method for its visualization. 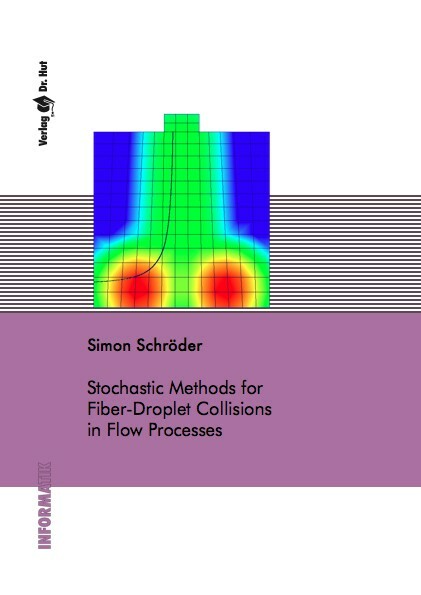 I point out how the results of these two visualization projects can be applied to the visualization of fibers and the properties of the stochastic model. The final application to fibers, however, is not included in this dissertation thesis.